The developer of simple mixing tools such as Magnus, TrackShaper and 3XOver has released Graffio, a multiband distortion AU/VST plugin designed to give your audio signals some frequency-dependent excitement. 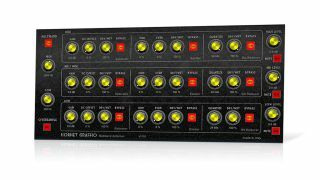 After splitting the signal into three frequency bands (dialled in as you please), Graffio gives you separate Saturator, Distortion and Bit Reduction settings for each. You can switch any or all of the three processes on or off for each band. For example, you could apply an exciter to the low band, beefing up odd/even harmonics as you see fit; pepper the mid band with amp distortion-style saturation and bitcrushing; and use a combination of all three on the high band. Each band's output level can be adjusted to tweak the balance and get it just right. Or, you can dispense with the bands altogether and just apply your desired processing to the whole signal. Get Graffio for €11.99 from hornetplugins.com, and check out the video below to see it in action.